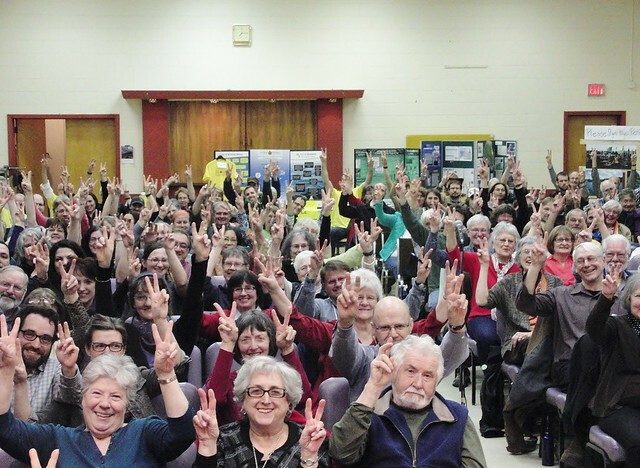 The audience at the Council of Canadians public forum against the Energy East pipeline in Thunder Bay, April 9, 2014. The first of the Ontario Energy Board (OEB) public consultations on the Energy East pipeline took place in Kenora on Tuesday and Thunder Bay last night. People in attendance raised questions about the impacts of the pipeline on water and the climate. The Council of Canadians Thunder Bay chapter was at this meeting and encouraged others to attend through their newsletter. A CBC Thunder Bay article reports, "Technical advisers with the Ontario Energy Board want to know more about the impact TransCanada's Energy East pipeline will have on drinking water sources, and they say special testing may be required to evaluate the safety of the pipeline in some areas of northwestern Ontario." "[OEB communications consultant John] McGrath said, after studying the application, the board's advisers are looking for more information. [He says,] 'There wasn't enough information for them to make a determination on about 95 per cent of the sources of drinking water and the sources of water that people use along the pipeline route... there had not been enough information in the pipeline application to ensure that the highest environmental standards were being met'... [The OEB wants TransCanada to] provide a list of significant water crossings so that people can see whether or not their local source of water will be protected with, for instance, valves at either side of the crossing, so that in the event of a spill the oil can be shut off quite quickly to reduce the threat of contamination to their water supply.'" In addition, this letter to the editor in the Thunder Bay Chronicle Journal by a local resident expresses dismay that climate considerations were not included in the mandate given to the OEB to review the Energy East pipeline, "this very impact on climate was of most concern to many citizen groups, NGOs and public institutions at the first round of consultations last spring." In light of this clear concern, the OEB commissioned an expert report on the implications of Energy East on climate pollution. While the content released so far has been preliminary, it is very disappointing. It makes assumptions that favour industry and downplay upstream climate pollution, more on that here. And Scott Harris, a Board member with Environment North in Thunder Bay, wrote earlier this month in the Chronicle Journal that, "A coalition of local citizen groups will be asking Thunder Bay council to oppose this project." Our Thunder Bay chapter is part of that coalition and they explain more about their efforts at city council here. A CBC article about the hearing in Kenora reports that both supporters and opponents of the 1.1 million barrels per day pipeline have concerns. "Kenora mayor Dave Canfield, who is also president of the Northwestern Ontario Municipal Association, said NOMA supports the pipeline, with some conditions. Canfield said the biggest concern is protecting lakes and rivers. [He says,] 'One of the main water crossings is the Winnipeg River, right in Kenora, just below Lake of the Woods and even though they're underground we want to make sure that that would be deemed a significant water crossing and we would have shut-off valves on either side of it.'" And, "A member of Citizens United for a Sustainable Planet in Thunder Bay said his concerns go far beyond the risk of a spill. [Peter Lang says,] 'This project is really a total expansion of the tar sands and represents a huge increase in emissions of carbon to the atmosphere. But it's also done to export all of that for the sake of big oil's profit. If it got into the Nipigon River, can you imagine the current that would take it right into Lake Superior? The safety of the watershed needs to be a paramount consideration.'" The Council of Canadians organized public forums in both Thunder Bay and Kenora last April that drew about 400 people who wanted to share their concerns about the pipeline with us and to hear Maude Barlow and others share critical information about it. OEB consultations will also take place in Kapuskasing (on January 19), Timmins (January 20), North Bay (January 21), Ottawa (January 22) and Cornwall (January 27). If you live in these communities, please be sure to attend the consultations and raise your objections to this pipeline project. For the details on when and where those hearings will take place, five reasons you should oppose Energy East, and what you can expect at the OEB consultations, please see our backgrounder on that. For information on the Council of Canadians campaign against the Energy East pipeline, click here.